Major Tour Highlights: Trummelbach Falls, train and cable car rides near Grindelwald, old town of Strasbourg, Heidelberg Castle, The Rhine River Cruise, Mont Sainte Odile Monastery and Schloss Burg Castle. Cologne Cathedral, a picture stop at Chillon Castle, Zermatt and the Matterhorn, Normandy Beaches, Mont Saint Michel, Riquewihr, Versailles, the Louvre, the Eiffel Tower, Notre-Dame, a picture stop at the Paris Temple PLUS the option to add the Rome Temple. We have combined a fantastic Rhine River Cruise (Basel Switzerland to Amsterdam) with a fantastic land tour in Switzerland and France. This special tour includes a picture stop at the new Paris Temple with an option to add a Rome Temple pre-tour. The tour portion starts in Paris, visiting the important sites, then travels by high-speed train to Switzerland. The major highlights of this tour will be the Rhine River Cruise and your stay in the quaint picturesque village Grindelwald at the base of the Eiger. We have included a clog train, waterfalls inside a mountain, cable cars, high-speed trains and so much more to go along with your fantastic River Cruise. You will absolutely love the many castles you will see along the way which will include: Mont Saint Michel in France, Chillon Castle in Switzerland. Join us on a wonderful romantic Rhine River cruise. Lower the pricing: By doing partial or full charters, we were able to save our passengers up to $1,000 PER PERSON! On some sailings the cruise company offers $250 per person discount, but NO ONE EVER offers a $600 to $1,000 per person discount, especially when you consider the extra costs to do enhanced shore excursions, the costs of bringing our Fun For Less Tours staff and the costs of bringing Dr. S. Michael Wilcox as a guest educator during the Rhine River Cruise. YES, the cruise line made us an unbelievable deal!!! Bottled water, fluffy bathrobes, and slippers free to use in each cabin. Note: AmaWaterways charges $1,680 for a 4-night land extension in Switzerland, which includes Lucerne and Zurich. We believe that Lucerne and Zurich are not as impressive as seeing Zermatt with the Matterhorn and the quaint village of Grindelwald! 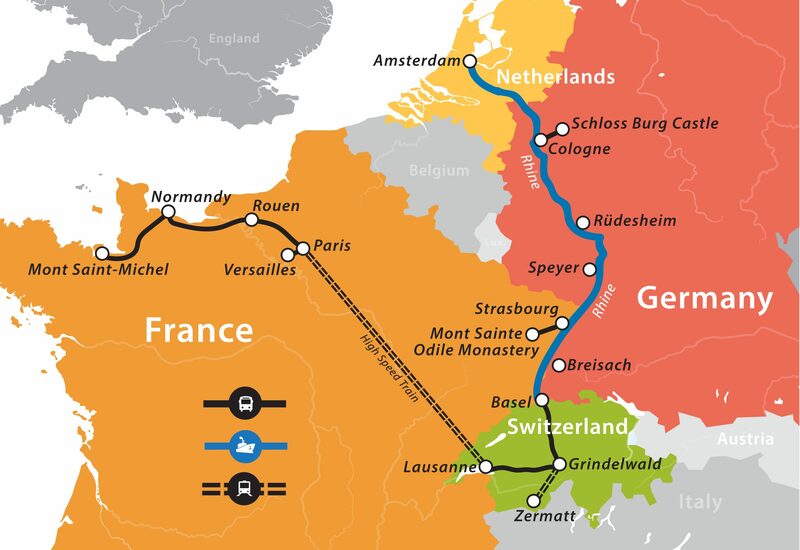 Our special land tour includes not only a better 3-night package in Switzerland, plus we have included 2 nights in a deluxe hotel in Paris and 2 nights hotel in Normandy, plus all the tours in Paris and a high-speed train ride from Paris to Switzerland – Our 7-night package is only $1,580 – that is $100 less than the ship charges for just their lesser 4 night package that includes only Switzerland. Eight days of buses, tours and entrance fees in Switzerland and France. *Does not include international air, tips or our optional Rome Temple Pre-tour. Does not include airfare between Rome and Paris. Important: We have improved the tour – We have added a tour to the Omaha landing beach of Normandy used by the American troops on D day. We have also added an additional educator to cover France and Switzerland. Jeff Lawson is the expert on Normandy, Paris and Switzerland (he has done over 20 tours to this area). He will handle the tours in Paris, Normandy and Switzerland. Dr. S. Michael Wilcox will handle the lectures on the Rhine River, history of Germany. Early afternoon arrival in Paris. Today Jeff Lawson will join your tour throughout the land portion. After clearing customs, we will drive to Paris Temple to do a picture stop. Then we will drive to Versailles where we will visit the palace of the king of France. This evening we will return to Paris where we will stay the next two nights. Today we head to Rouen. Once one of the largest and most prosperous cities of medieval Europe. It is here that Joan of Arc was executed in 1431. After our visit, we will continue to Normandy to overnight. This will be another highlight day. Today’s tour includes a visit to the Omaha Beach site of the American troops landing on D day. We will also visit The American Cemetery which is situated above Omaha Beach. Afterward, we will travel down the coast of France to the majestic island of Mont Saint Michel. This castle which looks like a walled city is located on an island just off of the coast of France. It was built approx. 700 years ago and today it looks and feels the same. We will return this evening to our hotel. This morning we will take our approx 3-hour drive to Paris, where we will then take a high-speed train to Lausanne, Switzerland. On arrival, we will head to Chillon Castle for a short picture stop before we continue our drive through the Alps to Grindelwald. We will spend three nights in this quaint village. We will depart our hotel early morning for a short drive to the train station. We will take the train to Zermatt where we travel through Switzerland’s beautiful Alps. We will have a walking tour and free time to enjoy this picturesque town and the Matterhorn. There will also be an additional option at an extra cost for those who want to take the cog-wheel mountain train up to the Gornergrat at over 10,000 ft! From there you have the opportunity to see the highest mountains of your trip, including a majestic view of the Matterhorn. After our visit to Zermatt, we will take the train back to Grindelwald to overnight. Today we will travel from Grindelwald to Basel. Along the way, we will make a stop at Bern, the capital of Switzerland, where we will do a short walking tour. Then we will continue to Basel where we will board our AmaWaterways ship. 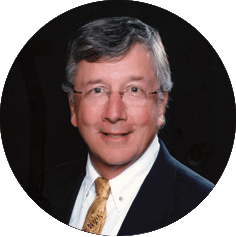 We will say goodbye to Jeff Lawson and be met by Dr. S. Michael Wilcox, who will be with you during your cruise portion of the tour. This afternoon you will have free time to wander around Basel. Tomorrow morning, we will set sail on the Rhine toward Amsterdam. Day 13: June 19: Rüdesheim – Rhine Gorge sailing a World Heritage section of the Rhine. Today we will fly to Rome. This morning after arriving in Rome we will visit the magnificent Coliseum and the Forum. This morning we will visit Trevi Fountain, which has been made famous by many movies including “Three Coins in a Fountain” before heading to our deluxe hotel. Then we will visit a separate country, Vatican City. We will visit St. Peter’s Basilica (the largest church in the world), St. Peter’s Square, the Vatican Museum, and the Sistine Chapel. This afternoon we will visit the Rome Temple, where you will have time to do a session. Today we will fly to Paris to meet the regular group. After clearing customs we will head to Versailles to tour before heading to our hotel. (Important Note: The flight from Rome to Paris is not included in the tour price. It is $148 for this flight).